The US is willing to work with Turkey to address its "legitimate" security concerns in northern Syria, Secretary of State Rex Tillerson has said. He was speaking after Turkey's military incursion into northern Syria to fight the Kurdish YPG militia at the weekend. Turkey sees the group as terrorists, but they have been crucial in a US-led coalition against the Islamic State (IS) group. Ankara said the US had to stop backing the YPG if they wanted cooperation. Thousands of civilians in the northern Syrian region of Afrin are reportedly trying to flee as Turkey continues its ground offensive. The UN Security Council has been meeting to discuss the operation, as well as the wider humanitarian situation in Syria. Turkey says its troops have seized territory from the Kurdish militia. It believes the fighters are an extension of the Kurdistan Workers Party (PKK), which has fought for Kurdish autonomy in Turkey for three decades. The YPG denies any direct links to the group. Mr Tillerson said on Monday in London that the US recognised Turkey's "legitimate concerns" for its security, and its right to defend itself from terrorist elements. It called for restraint from "both sides". 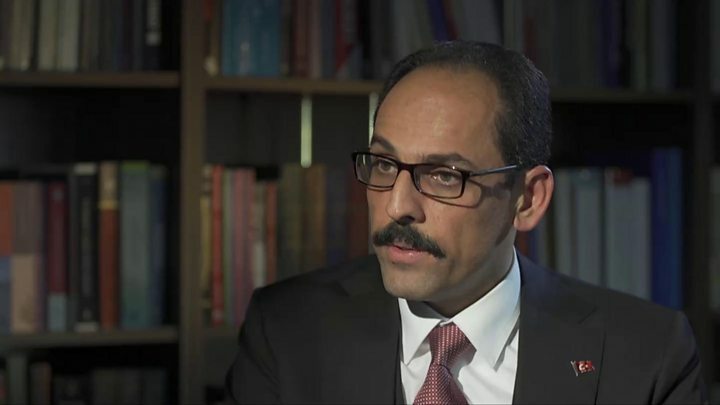 He said the US had proposed measures to Turkey and others to try to stabilise the situation. Turkey's Deputy Prime Minister Bekir Bozdag has expressed willingness to cooperate with the US, but said that it should first "stop arming terror groups and take back weapons already given". Reports say the US is discussing with Turkey and others the possibility of a "security zone" being set up in north-west Syria. Earlier Turkish President Recep Tayyip Erdogan vowed to "sort out" Afrin. "We will take no step back," he said in a live television broadcast. "We spoke about this with our Russian friends; we have an agreement." The YPG has denied that any of the Afrin region is under Turkish control. It also said that it had retaliated against Turkey's ground offensive with rocket fire on Turkish border areas. Two people died and 12 others were wounded when a rocket hit a camp housing Syrian rebel fighters near the border in Turkey's Hatay province, local reports said. 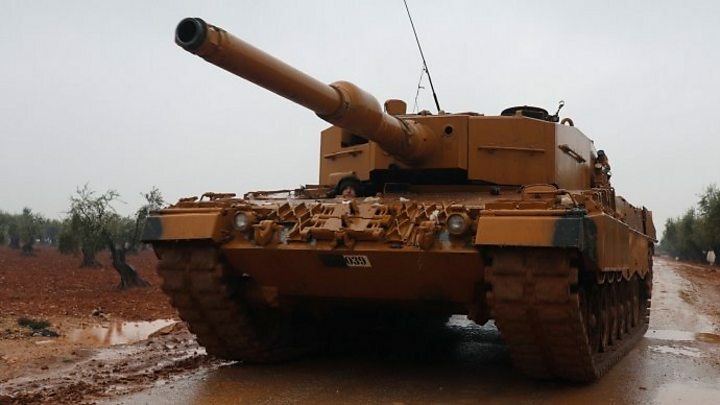 Turkish ground troops, assisted by rebels from the Free Syrian Army (FSA), crossed into northern Syria on Sunday as part of "Operation Olive Branch" - an offensive to push out the YPG. Plans for the operation are believed to have accelerated when US officials said earlier this month that it would help the Syrian Democratic Forces (SDF) alliance, which is dominated by the YPG, build a new "border security force" to prevent the return of IS. The SOHR said on Monday that 54 combatants had been killed since Saturday, including 26 Kurdish fighters and 19 pro-Turkish rebels. Twenty-four civilians had also died, it added - 22 in Turkish air and artillery strikes, and two as a result of Kurdish fire. The Kurdish ANHA news agency reported earlier that at least 17 civilians have been killed in Turkish attacks. Turkey said one of its soldiers had been killed. Turkish Foreign Minister Mevlut Cavusoglu has denied killing civilians, and accused the YPG of emanating "nonsense propaganda and baseless lies". Western powers, including the UK and France, have urged restraint in order to avoid civilian casualties. The French ambassador to the United Nations, François Delattre, said council members shared the view that Turkey should act with restraint. Mr Delattre would not say if Turkey ought to stop the operation altogether.